Over the past three plus decades, Chris Berman has become one of America’s most respected, popular, and beloved sportscasters. A six-time National Sportscaster of the Year, Berman will recount memorable moments, discuss the ins-and-outs of the sporting world and share what it’s like to be a sports journalist in today’s non-stop world. In October 1979 – one month after its inception – ESPN hired a little known 24-year-old sports anchor named Chris Berman. Over the past three and a half decades, Berman has become one of America’s most respected, popular, and in many ways, most beloved sportscasters of his era. A legend in the industry, Berman has also been recognized by the Pro Football Hall of Fame, his peers and countless other organizations for his exceptional contributions to sports broadcasting. With his trademark combination of genuine enthusiasm, knowledge and wit, he has come to embody ESPN in its dedication to entertaining and informing sports fans across the country. He is best known for his signature delivery of highlights in every sport, most notably on NFL Sundays. Six times the versatile Berman has been selected the National Sportscaster of the Year (1989, 1990, 1993, 1994, 1996 and 2001) by the members of the National Sportscasters and Sportswriters Association. Berman, who in 1989 became the first cable sportscaster to win the award, ranks second among sportscasters in winning this award from the NSSA. Berman and his various shows have won 10 Emmy Awards and 12 CableACEs. Berman received the distinguished Pete Rozelle Radio-Television Award from the Pro Football Hall of Fame in 2010 for his longtime exceptional contributions to radio and television in professional football, an unexpected and humbling honor which Berman cherishes most among a career of achievement. Berman was named the 2001 winner of the prestigious Reds Bagnell Award from the Maxwell Football Club of Philadelphia for “contributions to the game of football.” Previous recipients include Pete Rozelle, Don Shula, Joe Paterno, and Eddie Robinson, among others. In January 2009, Berman was honored with The Pat Summerall Award at the annual Legends for Charity dinner in recognition of his longtime excellence in football broadcasting. It’s hard to imagine NFL Sundays before Berman. The 2014 season will be his 30th consecutive as studio host of Sunday NFL Countdown, having doubled Brent Musburger’s 15-year record as the longest-running host of a weekly pro football studio show. The weekly Sunday morning pre-game show has won seven Sports Emmy awards for Outstanding Studio Show – Weekly (1988, 1991, 1994, 1995, 2001, 2003 and 2007 seasons). Sunday NFL Countdown has also garnered five CableACEs (1989, 1992, 1993, 1994 and 1995). Berman – a veteran of 32 Super Bowls, beginning with the 49ers’ first NFL Championship in Super Bowl XVI – has worked alongside Tom Jackson on Sunday NFL Countdown since 1987, when ESPN first acquired the rights to carry the NFL. The 2014 NFL season is their 28th year working together, which is unheard of in TV, falling just three years short of the longest duo – 31 years – in Johnny Carson and Ed McMahon. Berman and Jackson teamed together every Sunday night in the fall from 1987-2005 to host the critically-acclaimed NFL PrimeTime, which still holds the record as cable television’s highest-rated studio show. Since 2006, they continue to deliver all the NFL highlights to fans during both the 7 p.m. edition of the Sunday night SportsCenter(with John Saunders and Trent Dilfer) and on “The Blitz” on the 11 p.m. SportsCenter (asPrimeTime moved to Mondays). When Monday Night Football moved to ESPN in 2006, so did Berman’s signature weekly halftime highlights trip through the NFL, “The Fastest Three Minutes in Television.” It was a staple onSunday Night Football for all 19 years (1987-2005), and remains one now on Monday Night Football and Monday Night Countdown. In 2006, Berman traveled to the MNF city each week to host the Monday Night Countdown pre-game, halftime and post-game shows. He continues in that role today from the ESPN studios, and for the third year straight serves as play-by-play announcer for MNF’s late game in the opening weekdoubleheader with Dilfer. In two election years, Berman had the honor of conducting the final interviews with then presidential candidates Barack Obama and John McCain (2008) and President Barack Obama and Mitt Romney (2012) during the MNF halftimes on election eve. Berman played the role of halftime host for ABC Sports’ MNF from 1996-1999, and he served as host of the Monday Night Blast pre-game show in 1998. He also anchored ABC’s Wild Card Saturday from 1996-2005 and will fulfill the same role for ESPN when the network televises its first Wild Card playoff game in 2015. In 2000, 2003 and 2006, Berman anchored ABC’s Super Bowl XXXIV, XXXVII and XL pre-game shows working alongside the likes of Hall of Fame 49ers quarterback Steve Young and Jackson, two of his regular ESPN partners. 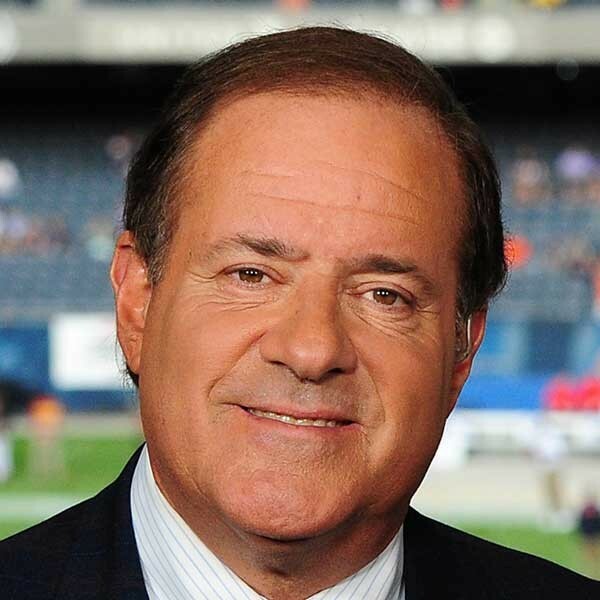 The pre-eminent NFL host, Berman has served as Master of Ceremony for the prestigious Pro Football Hall of Fame Induction ceremony for almost two decades, starting in 1999. The only one he missed was 2009, when he enjoyed the rare and distinguished honor of presenting Buffalo Bills owner Ralph Wilson, Jr. during the enshrinement ceremony, an experience surpassed only by being honored himself with the Rozelle Television-Radio Award in Canton in 2010. He considers these events to be among the most precious and unexpected opportunities of his distinguished pro football broadcasting career. Two others rank with them: being master of ceremonies at Hall of Fame 49ers coach Bill Walsh’s public remembrance at Candlestick Park in 2007, per the Walsh family’s wishes; and providing the impetus for Patriots’ coach Bill Belichick to allow quarterback Doug Flutie to convert a drop-kick in the 2005 season finale. It was the NFL’s first drop-kick since 1941. Berman has anchored ESPN’s annual NFL Draft telecast since 1987 and has taken part in the overall coverage of the draft since 1981. His prognosticating alter-ego – the “Swami” – has provided weekly NFL predictions and observations on SportsCenter since ESPN’s very first year in 1979. Berman also hosted ESPN’s two-hour documentary presentation in 2009 of The Greatest Game Ever Played highlighting the legendary 1958 NFL Championship Game between the Colts and Giants. Since 1990, Berman has served as a play-by-play commentator for ESPN Major League Baseball games, including division playoff coverage from 1996-2006. Among Berman’s career highlights was calling ESPN’s Emmy Award-winning telecast of Cal Ripken’s 2,131st consecutive game September 6, 1995. He has also hosted Baseball Tonight since its inception, the network’s nightly compendium of Major League Baseball highlights, news and features that won a Sports Emmy in 2003. He has covered 29 All Star games, including the Home Run Derby, and 2014 marks his 28th World Series for ESPN, including the 1989 San Francisco Earthquake. From 1986-2014, Berman covered the U.S. Open, a role that he relished, including the “NFL PrimeTime of golf,” the nightly U.S. Open highlights show. In 2003, he added play-by-play duties for ESPN’s coverage of the first and second rounds of the U.S. Open to his host role. Always looking to broaden his reach, Berman brought his passion and appreciation for hockey to the 2003 and 2004 Stanley Cup Playoffs as co-host of telecasts on ESPN and ABC. As a studio host, anchor and commentator, Berman is known for balancing in-depth reporting with ample amounts of humor and ebullience. “Sports should be fun, and I want viewers to share in the enjoyment I get from the games. But I also owe it to those same viewers to be thoroughly prepared and to know what I’m talking about,” Berman said, “or not talking about.” Berman received perhaps his most praise when he and analyst Buck Martinez chose not to speak during the 22-minute celebration in the Ripken game. Berman is famous for his use of nicknames while voicing over Major League Baseball highlights. Throughout his career he has been praised by the media, viewers and players across the country for his lighthearted and humorous approach. Berman’s personal favorites from the more than 1000 monikers he has coined include Roberto “Remember the” Alomar, Bert “Be Home” Blyleven, Jim “Two Silhouettes On” Deshaies, and Fred “Crime Dog” McGriff , just a sampling of names that often reflect his interest in history and music. Some of his favorite NFL nicknames are Andre “Bad Moon” Rison, Curtis “My Favorite” Martin, Steve “I’ve Got You Babe” Bono and Chris Fuamatu “Bad” Ma’afala. Berman regularly hosted SportsCenter in ESPN’s first 11 years, culminating in the network’s firstSportCenter Emmy Award in 1990. Although his assignments have changed, he always returns to host a few “just to keep DiMaggio’s hitting streak alive.” In 2005, he even took his turn at the anchor desk on the road, kicking off the SportsCenter 50 States*50 Days tour from Fenway Park in Boston. Berman established his craft working the overnight shift during ESPN’s first four years, often teaming with his good friend, the late Tom Mees. Berman also appears on ESPN Radio during the football and baseball seasons. “I want to be George Brett, Cal Ripken, the late Tony Gwynn and the late Walter Payton. I want to retire with the team I came in with. Once I go anywhere else, I’m a mercenary. I’m so proud to be one of the folks who helped lay the foundation here.” To that end, Berman signed a new multi-year extension in September 2012. At the conclusion of the new deal, Berman will have worked for ESPN for nearly 40 years. In 2014 Berman accepts the Giants of Broadcasting Award for his contributions to ESPN and the media landscape. In addition to the NSSA Awards, Berman was honored in 1990, 1992, 1994 and 1996 with CableACE Awards as cable’s best sports host. Also, he was part of the SportsCenterteam that won the CableACE in 1990. In 1995, 1996, and 1997, Berman was named “Sportscaster of the Year” in the Studio Host category by the American Sportscasters Association. The Cable Guide readers voted him “Best Cable Sportscaster” in 1987, 1988 and 1990; TV Guide chose him as one of the “Top Stars of the 90s”; People magazine named him one of “TV’s Most Fascinating Stars” of 1997; and he was profiled by 60 Minutes Sports in 2013. He has also received 11 Emmy nominations as best sports host in 1990, 1991, 1993, 1994, 1995, 1996, 1998, 1999, 2001, 2008 and 2010. Berman was named in 2008 to the CableFAX Hall of Fame as a member of the inaugural class of inductees. In 1992, the syndicated “NFL Pre-Season Special” surveyed NFL players on their favorite football commentator and 43 percent, an overwhelming majority, selected Berman. He was also listed on The Sporting News’ Top 100 Most Powerful People in Sports in 1995 and 2005. In 2005, the readers of SI for Kids chose Berman second as most favorite sportscaster, behind only John Madden. On May 24, 2010, Berman was honored by the Hollywood Chamber of Commerce with a star on the Hollywood Walk of Fame as a tribute for his more than 30 years contributing to the sports television industry. A long-time aficionado of rock and roll, Berman has appeared on stage singing with Huey Lewis and the News more than a dozen times. In addition, he sang twice with Eddie Money, appeared in a video with Hootie and the Blowfish, and was joined by Glenn Frey of the Eagles for a special “Hotel California” Super Bowl edition of “The Swami.” Berman is also a golf enthusiast and has played many Pro-Ams on the PGA Tour. Through the years, his professional partners have combined to win 25 majors. Berman has played himself in 14 motion pictures – The Longest Yard, Little Big League,Necessary Roughness, Draft Day, The Waterboy, Grown Ups 2, Eddie, The Garbage Picking Field Goal Kicking Philadelphia Phenomenon, Big Daddy, Second String, Even Steven, Kingpin, The Program, Celtic Pride – and on several television shows including Sesame Street, Spin City, The Jersey and Arli$$. He has also appeared on Late Night with David Letterman, The Tonight Show with Jay Leno and Jimmy Kimmel Live. In 1986, while working at ESPN, Berman also provided daily weekday sports commentaries for KFRC-Radio in San Francisco and, in 1987, for WFAN-Radio in New York. In September of 1999, Berman was honored by his boyhood team, the San Francisco Giants, with the privilege of throwing out the first pitch at one of the final games ever at historic Candlestick Park. He also hosted ESPN’s coverage of the final 49ers game at Candlestick Park, including a post-game ceremony on December 23, 2013. He is proud to say that he’s the only guy East of the Rockies to have a patch of outfield grass from both Candlestick Park and AT&T Park growing in his backyard. Berman graduated from Brown University in 1977 with a Bachelor of Arts degree in history. His first broadcasting position came while he was a student at Brown as sports director for WBRU Radio and commentator for basketball, football, ice hockey and baseball games. He also assisted NBC Sports telecasts in New England – including the memorable Game 6 of 1975 World Series – and served as a correspondent for WEAN, a Providence, R.I. news radio station. In November 1991, he was inducted into the Brown University Athletic Hall of Fame, and in May 2007 he received an honorary Doctor of Humane Letters degree from his alma mater. Berman began his career as a disc jockey at WERI in Westerly, RI, hosting a news-oriented talk show and covering high school football and basketball games. One year later, he joined WNVR Radio in Waterbury, Conn., broadcasting high school football games, co-hosting a sports talk show and doing traffic reports. Berman’s first television exposure came in 1979 when he joined WVIT-TV, an NBC affiliate in Hartford, Conn., as a weekend sports anchor. Berman, born May 10, 1955, resides in his native Connecticut with his wife, Kathy. They have two grown children, Meredith and Doug.